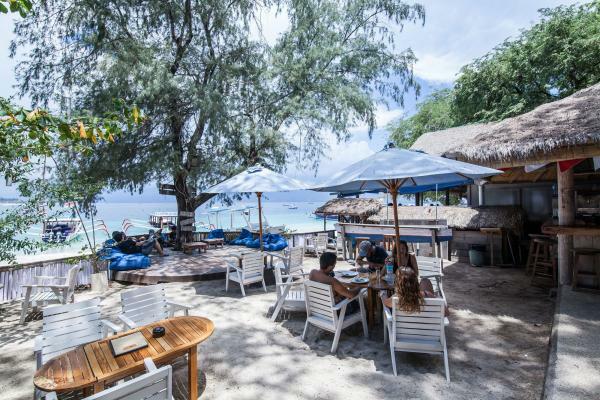 We are located on the beach at Manta Dive Gili Trawangan, a tiny paradise island north west of Lombok just east of Bali, Indonesia. The Gili Islands, Trawangan, Meno and Air, are surrounded by white sand beaches and vibrant clear waters. The diving on Gili Trawangan is year round and the fringing coral reefs that surround the Gili Islands support a phenomenal array of marine life that will captivate scuba divers of all levels. Ben and Harriet run the dive shop throughout the year and will gladly answer any questions you may have relating to getting from Bali to Gili, accommodation on Gili Trawangan, fun diving, dive courses or anything else. Together with our Instructors and Divemasters we offer a wealth of diving experience unequalled in Lombok and the Gili Islands. This ensures that dive courses and fun dives are conducted in both a safe and enjoyable manner. Manta dive is the only Diamond Rated Dive Center and Instructor Training Facility in the region with Instructors qualified to teach both Padi and SSI dive courses. 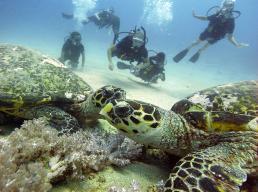 We insist on the best tuition possible so make sure our diving Instructors are highly qualified. Perfect for post dive socialising and late afternoon drinks, Chappies Bar, located right on the beach in front of Manta Dive is proving to be a popular afternoon hangout. Manta Cafe is still serving some of the best baguettes on the island. Tucked away at the back of the dive center you'll find it hard to get a tastier lunch. 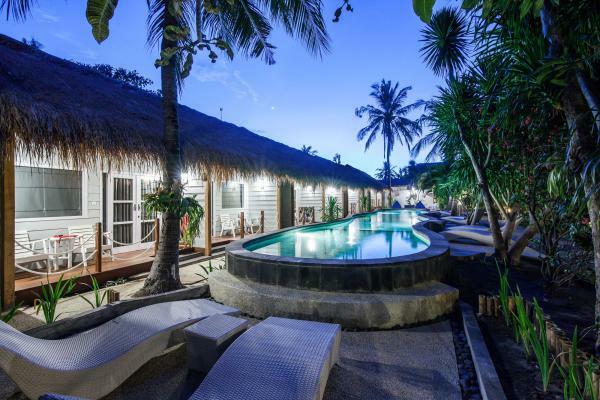 We have recently opened 12 new rooms at Manta dive on Gili Trawangan and a new 20m swimming pool specifically for our guests. The rooms have the same facilities as our traditional bungalows but they are modern in design. Manta dive Gili Trawangan has also replaced one of its dive boats. ´George´the new addition to the fleet provides a more comfortable journey to the dive sites and is more spacious than her predecessor, allowing our fun divers and students a more relaxing dive experience. Takro - We have a takro court. This local sport is a cross between volleyball and football and a great way to relax after diving, it´s also a great spectator sport.